CWS custom coded web-based software for ARA in Austin, Texas to significantly decrease overhead and increase profits and turnaround time: ARA customers submit an online order and ARA team leaders assign the new report to one of their appraisers, who can access the app from anywhere via a web browser. 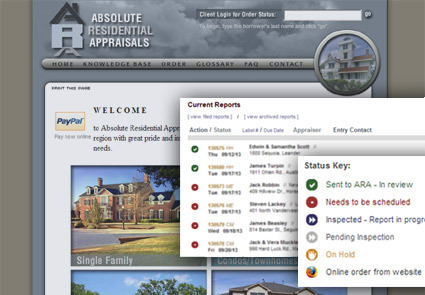 As progress on the report occurs, appraisers update the report status online, and both ARA team leaders and the customer are notified by email. Customers can check their order status anytime online and are notified when their report is complete. Years of ARA reports are archived and searchable.